During her time on "Ragged Royalty", Ashley developed a reputation as the show's scowling shrew. Clever editing, no doubt, but she still hates it. Now that her stint on the show is complete, she's determined to get the revenge she deserves on the producers who made her look so awful. Without it she can't move forward and decide what comes next for her. She knows what doesn't, though--ever seeing MC or Kent or any of the other contestants again. She hates all of them and they hate her too. Who could like "Angry Ashley"? After reluctantly enlisting fellow contestant Sam's much-needed help in her "Bad Will Hunting" mission, Ashley turns up a ton of dead ends but also some exciting life-changing possibilities. But she can't get over her need to get one over on Will, and on everyone else who's wronged her. With so much "bad will" in her way, can Ashley ever find true happiness? 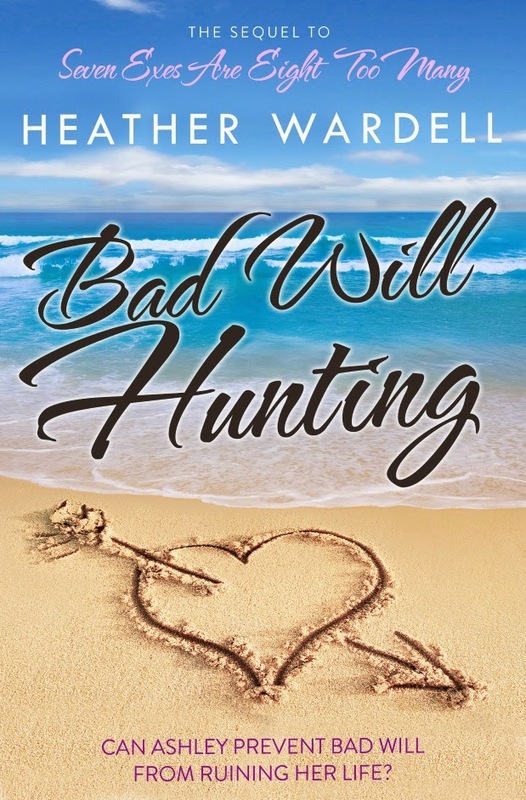 I have been one of Heather Wardell's biggest fans for years now, loving her books for so many reasons. I love her writing style, which flows so easily that I usually read her books in one sitting. Her characters are so easy for me to relate to, and I always see myself in her characters in some way. Heather's plots are just right: detailed, interesting, and surprising. I love that her books are contemporary women's fiction without a lot of bedroom scenes (sometimes none at all). They are about falling in love, which is so much fun to read about. But my favorite thing about Heather's books is the character growth in each story. I love seeing people change, and that change usually prods me to look at my own life and the areas where I need improvement. It's the mark of a great writer, the ability to move a reader towards personal growth, all from the simple act of reading a book! When I first started Bad Will Hunting, I didn't know if I was going to be able to see myself in Ashley. She was so angry (but justly so) that it consumed her every waking thought and every action. Her anger was her driving force in life, and her only source of pleasure and satisfaction. I get mad, sure, but I've never been mad like Ashley is in Bad Will Hunting. Or course, I've never had the things that happen to Ashley happen to me. She has plenty to be righteously angry about. So I started Bad Will Hunting thinking, "well, I'm not like Ashley, but I know this will still be a great read," simply because it's a "Heather" book. And it was! But to my surprise, Ashley really grew on me as I read her story, and by the end of the book I found several aspects in which we really were alike. I think that everyone has at some point in their lives experienced the burning pain of loss and betrayal. I know I have, as well as the ache for revenge. Revenge makes you feel better in the moment, but it hurts you in the long run. For much of the story, Ashley doesn't know this. All she knows is that it feels like the world is out to get her and she has to look out for herself because no one else will. And then when her expectations about others' behavior are proved right, and she is hurt, she delivers retribution. Ashley's revenge sometimes exceeds her initial hurt and she ends up feeling worse than she did before...until she focuses her attention on her next target. I understood Ashley because I too, have wanted to hurt those who have wronged me. I've never gone as far as Ashley usually does, but I have done things I'm not proud of in the name of getting back at those that hurt me. Ashley's rage is all-consuming, coiled inside of her like a poisonous snake waiting to strike. It affects every area of her life, and all of that negative energy builds on itself until finally Ashley reaches a turning point. That turning point, the crux of the story, embodied everything I love about Heather's writing. The resolution of the plot's main conflict was realistic, uplifting, and had practical applications for my own life. In the end, Bad Will Hunting is a story about a woman who learns that acts of kindness, love, and acceptance can heal a battered heart. It's not the end point that is most important, it's the journey. I'm glad to have taken the journey with Ashley and learned some things about myself along the way. If you are new to Heather Wardell, her first book, Life, Love, and a Polar Bear Tatoo, is free on her website here. Read it...you won't be disappointed!